Andre Boyer is the latest gold bracelet winner at the 2015 World Series of Poker. 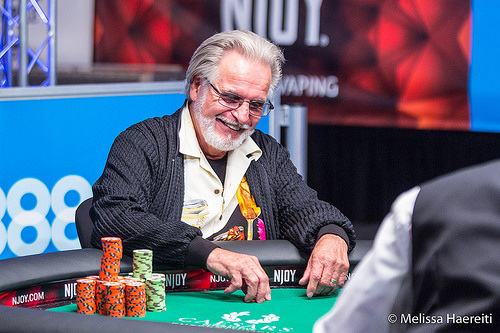 The 72-year-old retiree from Montreal, Quebec (Canada) won his second career gold bracelet and the first in ten years with an enthusiastic victory on a Friday night at the Rio in Las Vegas. Boyer’s victory this time around was far sweeter than the first. He remembered the occasion of his first career victory, which largely fell on deaf ears. Just prior to the start of the 2005 Main Event Championship, Boyer won the last preliminary event which ended at about 3 am. By the time his victory was reported, the biggest poker event of the year was underway. Few people noticed. Nonetheless, Boyer’s enthusiasm for the game remained undiminished. After his victory, he returned to his native Quebec and became one of the game’s most active ambassadors. He founded a Quebec Poker Players League and helped to organize events. Some of the disciples of the clubs and activities which Boyer helped to develop included 2010 world poker champion, Jonathan Duhamel, among others. This marked the second year this novelty tournament has been offered at the WSOP. The Split Format means players are tested in four different table configurations. Over the course of four days, survivors must compete against different table lineups, ranging from 2 to 9 players. Day One included 9-handed play. Survivors that reached Day Two played 6-handed. Those who progressed to Day Three played 2-handed matches, otherwise known as heads-up. Then, the final eight player returned for Day Four and the final table, which was played 8-handed. The objective is to test players among different formats, requiring the participants to adapt to a wide variety of game conditions. Boyer certainly played well, and then some. He topped some very tough players, and virtually an entire field that was younger, with some opponents young enough to be his grandchildren. “I really think being older can be an advantage,” Boyer said when asked about playing versus mostly younger players. “They look at me and think I’m a tourist. That’s okay with me. I try to turn that to my advantage. Boyer did turn disadvantages into advantages throughout this three-day event. It’s been his mantra since he first started playing poker decades ago. “Everything changes over the years,” Boyer said when asked about differences in poker now versus when he first arrived on the scene. “Every profession does things differently and if you don’t adapt, you don’t survive. Poker is like that. Players that adapt to changes, whether in the way poker has changed or how this tournament was played at different stages – those are the survivors. One of the most memorable oddities from this finale was the unusual mix of international players who made it to the final table. Amazingly, players from eight different nations constituted the final eight seats -- including Belgium, Canada, Denmark, France, Ireland, Israel, Philippines, and then United States. However, French was the major language spoken by the time the heads-up showdown took place between Boyer, from Montreal and another player -- Erwann Pecheux, from Paris, France. The duo made for an exciting finale as a large crowd of French and Quebec natives jammed the gallery, rooting throughout Day Three or both players to play face-to-face. They eventually got their wish. Erwann Pecheaux finished as the runner up, enjoying his best payout ever at the series. The Parisian collected a nice consolation prize amounting to $156,098. 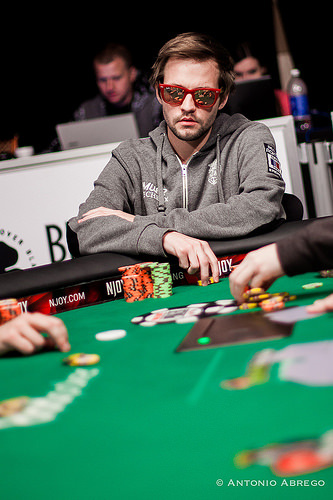 As for Boyer, he’s one of Canada’s most devoted WSOP participants. His legacy at the series dates back to 1996. Boyer has quite a poker resume, especially considering he’s been mostly a part-time player for many years since retiring from his own business. Aside from his gold bracelet win, Boyer’s claim to fame was a final table appearance in the 1996 Main Event Championship won by Huck Seed. Boyer’s WSOP record now shows 29 cashes, 8 final table appearances, and 2 wins. He’s also raked in nearly $1.3 million. Not bad for a poker player now in his 70s, and still playing with the world’s best. Even though Boyer’s first victory didn’t have many witnesses, this one certainly did. Not only were the French (and Canadians) out in full force chanting throughout the finale, a worldwide viewing audience turned in via live stream to watch the finale on WSOP.com. “For me, having the crowd here and getting so excited really made this one better,” Boyer said. Second Place: This runner-up finish was heartbreaking to Pecheux, who has a number of second-place finishes and close calls in major events, including the World Poker Tour. He had the chip lead at one point by about a 2 to 1 margin versus Boyer, but then lost two big hands which cost him the elusive victory. 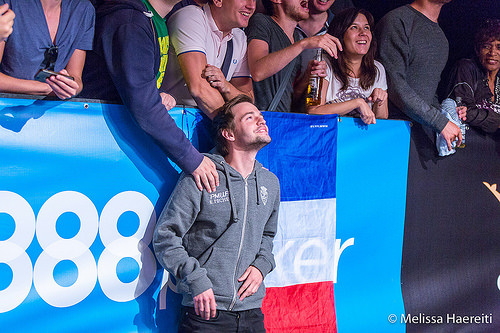 Pecheux now has 12 WSOP cashes, two final table appearances, and three deep runs at this year’s series. The Poker player from Paris collected his highest Las Vegas payout ever, at $156,098. Third Place: Andrew Gaw, from the Manila, The Philippines ended up in 3rd place, which was one of the highest finishes ever by a player from that country. Gaw final tabled and event at the WSOP Asia-Pacific championship in Australia two years ago, finishing sixth. Hence, this was his best WSOP showing, which paid out $109,015. Fourth Place: Chris Bolek took 4th place. He’s amn Ecuadorean-born poker player now residing in Boca Raton, FL. Bolek cashed for the third time as this year’s series and 16th overall for his career. He won a WSOP Circuit gold ring two years ago at West Palm Beach. Collecting $76,605 for this fine effort, this was the biggest cash prize yet of his career. Fifth Place: Gavin O’Rourke, from Portlaoise, Ireland came in 5th place. He’s a 31-year-old poker pro who used to be a train driver before taking up the game full time. O’Rourke had previously won WCOOP and SCOOP events played online. This marked his third time to cash at the series, which paid $55,981. Sixth Place: Jonas Christensen was the 6th-place finisher. This was his second cash this year, which paid $41,249. Christensen, from Holbaek, Denmark is a 22-year-old poker pro who says he learned the game by watching Jason Sommerville’s strategy show on Twitch. Seventh Place: Idan Raviv came in 7th. He hoped to become the first Israeli poker player ever to win two gold bracelets in a single year. Raviv, from Tel Aviv, won the $1,500 buy-in Six-Handed NLHE title, two weeks earlier. This time, he didn’t rise as high, but still ended up making his second final table of the summer. This cash was worth $30,053, which moves him close to $500,000 in earnings at the 2015 WSOP. Eighth Place: Isaac Kawa rounded out the final table as the 8th-place finisher. This was the first-ever WSOP cash for the player from Brussels, Belgium. This debut final table was worth a $21,096 payout. 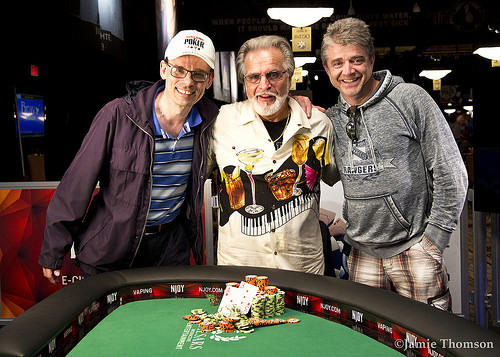 Aside from the final table finishers, other gold bracelet winning players and notables who cashed included – Alex Kravcheno (59th), poker author and historian Jim McManus (57th), John Reading (54th), and Jordan Smith (46th). Erwann Pecheux moves all in and Andre Boyer calls. The board runs out and Andre Boyer takes the pot and wins the tournament. Erwann Pecheux finishes 2nd and takes home $156,098. Erwann Pecheux raises the button to 200,000 and Andre Boyer calls out of the big blind. The dealer spreads a flop of and Boyer leads out for 350,000. Pecheux calls and the two see the turn. Again Boyer leads out, this time for 450,000. Pecheux calls and the completes the board. Boyer slows down with a check and Pecheux slides forward a tower of a bet, totaling 715,000. Boyer moves all in and Pecheux folds. 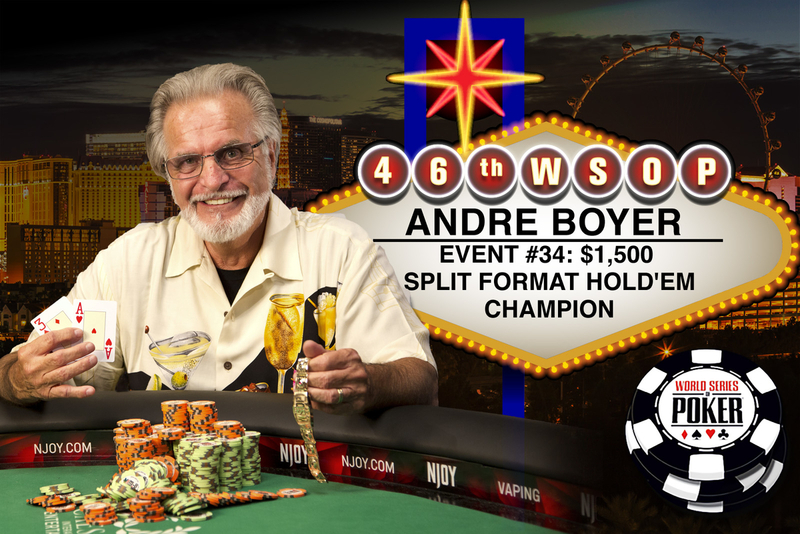 Andre Boyer raises to 330,000 and Erwann Pecheux folds. Andre Boyer raises to 310,000. Erwann Pecheux calls. The flop is . Pecheux quickly checks and Boyer fires out 400,000. Pecheux gives it up. Erwann Pecheux raises to 260,000. Andre Boyer moves all-in and Pecheux folds. Andre Boyer limps in the small blind. Erwann Pecheux checks. The flop is . Pecheux checks and Boyer bets 300,000. Pecheux folds. Erwann Pecheux limps the button and Andre Boyer checks his option from the big blind. The dealer spreads the flop of and Boyer moves all in for his last 700,000. Pecheux thinks about it briefly and then calls. The on the turn keeps Pecheux in the lead as he is one card away from taking home the bracelet. The dealer burns a card and rips off the on the river and Boyer jumps out of his seat and heads towards his rail with a Ric Flair-esque walk. The flop is and both check. The turn is and again both check. The river is and Pecheux checks. Boyer thinks about betting but checks. Pecheux tables to take the pot. Erwann Pecheux limps the button and Andre Boyer checks his option. The dealer spreads a flop of and Boyer leads out for 300,000. Pecheux announces all in and Boyer folds. Andre Boyer limps the button and Erwann Pecheux checks his option out of the big blind. The dealer spreads a flop of and both players check to see the on the turn. Again the action goes check-check and the hits the river. Erwann Pecheux tables to take down the pot. Erwann Pecheux limps the button and Andre Boyer moves all in. Pecheux folds and Boyer takes down the pot. Andre Boyer limps in the small blind, only for Erwann Pecheux to raise to 400,000 from the big blind. Boyer throws his hand away. Erwann Pecheux limps in the small blind and Andre Boyer checks his option. The flop is and Boyer checks. Pecheux fires 120,000 and Boyer calls. Both players check the turn and Boyer fires 300,000 on the river. Pecheux calls and tables to take the pot. Andre Boyer raises to 260,000 and takes the blinds and antes. Erwann Pecheux raises to 250,000 and takes the blinds and antes. Andre Boyer raises to 200,000 on the button and Erwann Pecheux calls from the big blind. The dealer spreads a flop of and Pecheux check-calls a bet of 300,000 from Boyer. The turn brings the and again Pecheux check-calls a bet but this time its for 500,000. The falls on the river and Pecheux checks for a third time. Boyer tanks for nearly two minutes before checking back and Pecheux tables for quad deuces. Erwann Pecheux limps the button and Andre Boyer checks his option. The two players check down a board of and Erwann Pecheux tables to take down the pot. Andre Boyer raises to 200,000 and Erwann Pecheux calls. The flop is and Pecheux checks. Boyer bets 200,000 and Pecheux calls. The turn is the and both players check. They do the same on the river and Pecheux tables to claim the pot.